Employing both quantitative and qualitative methods, my research focuses on how journalists cover political events in a changing media ecosystem. My projects have focused on elections and protests, both in the United States and in Brazil. I’ve published several articles in peer-reviewed academic journals including The International Journal of Press/Politics, Journalism: Theory, Practice and Criticism, Mass Communication and Society, Journalism Studies, Journal of Broadcasting and Electronic Media, Journalism Studies, Digital Journalism, the International Journal of Communication, and the Journal of Information Technology & Politics. In 2017, my dissertation won the Gene Burd Outstanding Dissertation in Journalism Studies Award from ICA, and the best dissertation award from the Mass Communication and Society division at AEJMC. You can download my complete CV here, download the hyperlinked articles or see some of my presentations and posters below. Saldana, M. & Mourão, R.R. (2018). Reporting in Latin America: Issues and perspectives on investigative journalism in the region. International Journal of Press/Politics, ahead-of-print. Kilgo, D.K. ; Mourão, R.R. ; & Sylvie, G. (2018). Martin to Brown: How time and platform impact coverage of the Black Lives Matter movement. Journalism Practice, online-first. Molyneux, L. & Mourão, R.R. (2017). Social media echo chambers: Political journalists’ normalization of Twitter affordances. McGregor, S. C. & Mourão, R.R. (2017). Second Screening Donald Trump: Conditional Indirect Effects on Political Participation. Journal of Broadcasting & Electronic Media, 61(1), 163-181. McGregor, S. C., Mourão, R.R., & Molyneux, L. (2017). Twitter as a Tool for and Object of Political and Electoral Activity: Considering Electoral Context and Variance Among Actors. Journal of Information Technology & Politics, (2017): 1-14. McGregor, S. C., Mourão, R.R., Neto, I., Angelucci, A., & Straubhaar, J. (2017). All the Kids are Doing It: Second Screening as Convergence in Brazil and the US. Journal of Broadcasting & Electronic Media, 61 (01), 162-181. Mourão, R. R. (2016). “Binders Full of Tweets:” Twitter Coverage of “Women’s Issues” in the 2012 elections. Electronic Journal of Communication, 26 (1). Mourão, R.R., Diehl, T., & Vasudevan, K. (2016). I Love Big Bird: How journalists tweeted humor during the 2012 presidential debates. Digital Journalism, 4(2), 211-228. Mourão, R.R., Saldaña, M., McGregor, S.C., Zeh, A.D. (2016). Support for Protests in Latin America: Classifications and the Role of Online Networking. Social Sciences, 2016, 5(4), 58. McGregor, S. C., & Mourão, R. R. (2016). Talking Politics on Twitter: Gender, Elections, and Social Networks. Social Media+ Society, 2(3), 1-14. Stephens, M., Yoo, J., Mourão, R. R., Gutierrez, F. M., Baresch, B., & Johnson, T. J. (2016). The life of the Tea Party: Differences between Tea Party and Republican media use and political variables. Atlantic Journal of Communication, 24(3), 157-171. Mourão, R. R., & Wood, C. C. (2015). The Digital Inequality in Brazil, 2004–2009: Evolution and Effects on Political Engagement. Journal of Latin American Communication Research, 5(1), 115-139. Mourão, R. R. (2015). 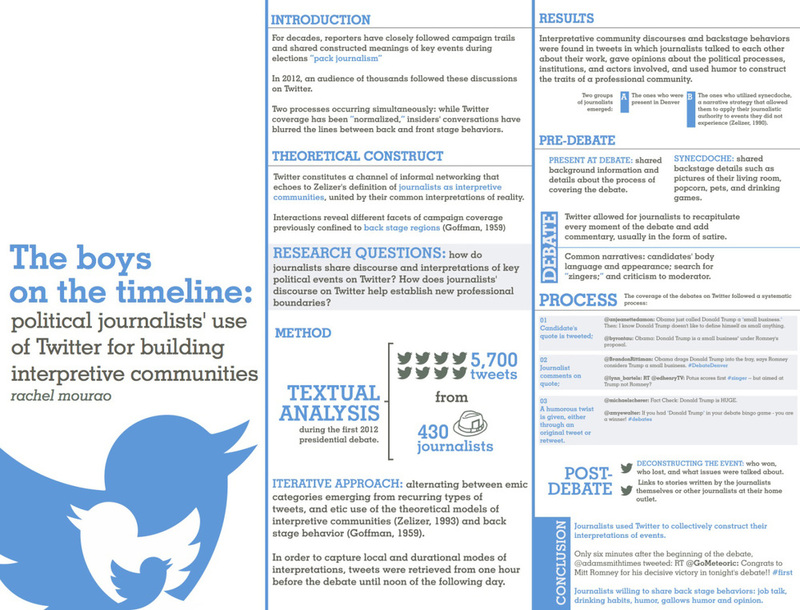 The boys on the timeline: Political journalists’ use of Twitter for building interpretive communities. Journalism, 16(8), 1107-1123. Mourão, R.R., Yoo, J., Geise, S., Araiza, J.A., Kilgo, D.K., Chen, V., & Johnson, T.J. (2015). Online News, Social Media, and European Union Attitudes: A Multidimensional Analysis. International Journal of Communication 9, 1-20. Mourão, R. R. (2014). A Bloody Weekend in Manaus: A Case Study of Televised Crime Reporting in Amazonas, Brazil. The Latin Americanist, 58(2), 3-21. Stephens, M., Yoo, J., Mourão, R. R., Vu, H. T., Baresch, B., & Johnson, T. J. (2014). How app are people to use smartphones, search engines, and social media for news? : examining information acquisition tools and their influence on political knowledge and voting. Journal of Information Technology & Politics, 11(4), 383-396. Molyneux, L., Mourão, R.R., & Coddington, M. (2016). US political journalists' use of Twitter: Lessons from 2012 and a Look Ahead. In R. Davis, C Holtz-Bacha, & M.R. Just (Eds. ), Twitter and Elections around the World: Campaigning in 140 Characters or Less. New York, NY: Routledge. Lawrence, R., McGregor, S. C., Cardona, A., & Mourão, R.R. (2015). Personalization and Gender: 2014 Gubernatorial Candidates on Social Media. In J. Hendricks & D. Schill (Eds.). Communication and 2014 Mid-Term Elections: Media, Message, and Mobilization. Forthcoming. In 2013, small demonstrations against bus fares in Brazil evolved into a series of large protests expressing generalized dissatisfaction with center-leftist President Dilma Rousseff. After she was reelected, another wave of protests returned in 2015 with a clear agenda: the removal of the President. Communication research has long examined the “protest paradigm,” a pattern of coverage delegitimizing social movements. The Brazilian context provided a chance to assess the extent to which the paradigm holds when protests take on an elite-driven narrative contesting the government. Through a quantitatively-driven mixed methods, results revealed that when grievances evolved into coherent anti-government demands, official sources from opposition parties served to legitimize the movement. This study departs from an understanding of protest coverage as paradigmatic towards a complex view of the relationship between protestors and the press. The experience of Brazil shows that when an elite opposition supports protests, journalistic norms and routines validate demonstrations.